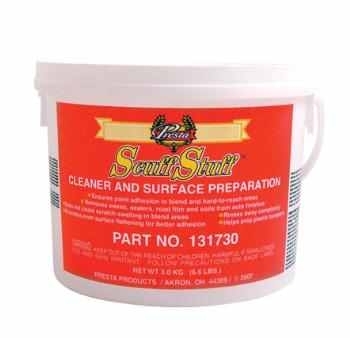 Water-soluble cleaners strip away waxes, sealers, road film and dirt while super fine abrasives create a consistent surface profile. This profiling helps coatings spread flatter and bond more securely to the treated surface. Use Scuff Stuff to prepare blend and hard-to-reach areas, such as around door locks and under seals and door jambs. It is ideal for cleaning and abrading urethane bumpers. Scuff Stuff rinses off easily and completely with water.